Version 0.3 of this package fixes the issue where, on 32-bit devices (iPod 5, iPhone 4S/5, iPad 2, iPad Mini 1) a specific background process (launchd) would sometimes “spin”, burning CPU and battery, or even heating up. 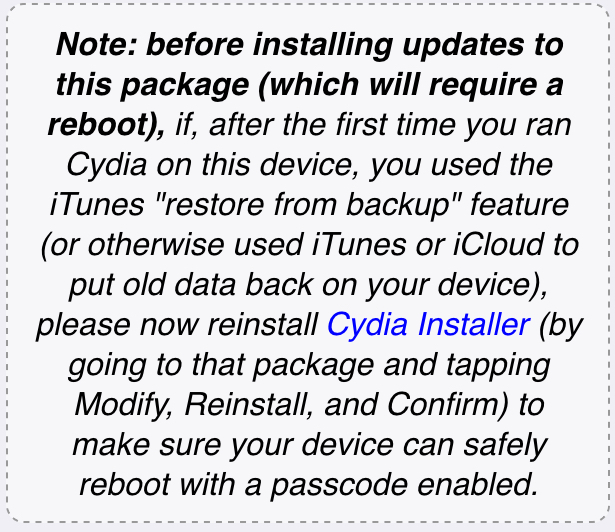 Before installing updates to this package (which will require a reboot), if, after the first time you ran Cydia on this device, you used the iTunes “restore from backup” feature (or otherwise used iTunes or iCloud to put old data back on your device), please now reinstall Cydia Installer (by going to that package and tapping Modify, Reinstall, and Confirm) to make sure your device can safely reboot with a passcode enabled. Some users on 64-bit devices are reporting mild to serious issues with this package. According to the Pangu team, they have changed almost nothing on 64-bit, and have not seen the issue themselves in their testing. We have pulled the package anyway, and the people at Pangu are working on doing a more detailed analysis of the issue. Feel free to share your thoughts and questions in the comment section below. This entry was posted in Apple, Cydia, Jailbreak and tagged cydia, iOS 8, jailbreak, Pangu, Pangu 8.0-8.1.x Untether Update. Bookmark the permalink.